Gambit Gaming - Analysis of their extreme turn-around. Start / E-sport / Gambit Gaming – Analysis of their extreme turn-around. One of the really interesting stories to come out of the EU LCS has been the turnaround of Gambit Gaming. They went from losing their first 5 games, pretty convincingly, to now winning their last 5 and being tied for 5th place in the EU LCS standings. This stark turnaround has been really interesting, and it is worth investigating what exactly changed in Gambit that has sparked this change. 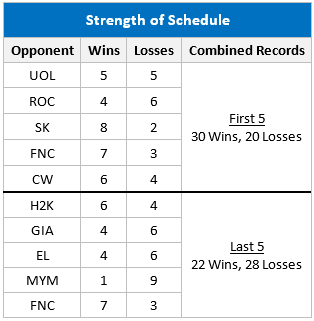 One of the differences that Gambit themselves commented on was their difference in strength of schedule. In the first half they had stronger competition - their first 5 opponents have a combined record of 30W-20L (using current records), meanwhile their opponents in the second half had a combined 22-28 record. While there is a slight difference here, I don't think this is that significant of a reason. After taking down Fnatic last week we know they are on a real run and there must have been a change in their play. One of the most talked about reasons for their success has been the turn "return of Diamond". 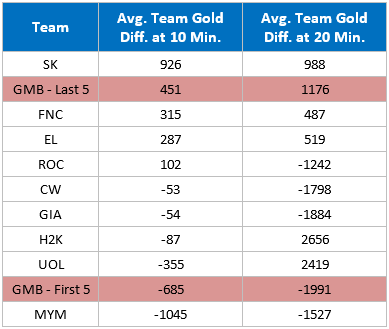 Diamond had the largest growth in KDA and achieved a ~13 KDA during this streak, and more importantly his kill participation has gone up to extremely high levels at 83%, which would put him at the top of all of LCS if only these 5 games counted. 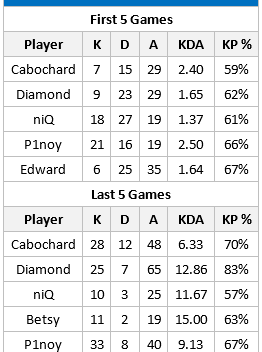 Diamond has been an important member in their success as a team, but his stats look overly good because winning teams always have great K/D/A. His kill participation has shown he has been integral to this revitalized Gambit. However, I think Diamond was not the biggest change to this team's success. After investigating Gambit thoroughly I think the biggest turnaround has been their early game. 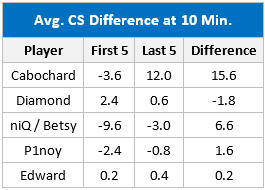 Gambit went from the 2nd worst early gold average in their first 5 games to the 2nd best in their last 5 games. Note: In first 5 games they 2v1'd 2 out of 5 games, while in the last 5 they 2v1'd 3 out of 5 games. Only slight difference. What changed in Gambit’s play style that brought such an improvement? To investigate I looked at just the kills that happened before 10 minutes. In their first 5 games, Gambit was 10-10 in Kills-Deaths, an action pace that was well above the average 2.66 kills or deaths in the average EU game. In their second half they slowed down and played more calculated and saw success, with their Kills-Deaths being 7-4, a bit under the average pace. 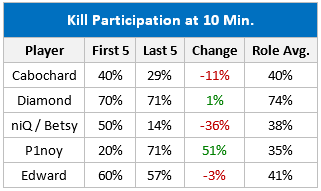 P1noy participated in 71% of the kills before 10 minutes in their last 5 games, a kill participation rate that is over double the EU LCS ADC average. Gambit changed the way they played 2v1s from the standard jungle+top double jungle to a dive strategy earning a kill and tower for the dual lane. This shift in strategy helped P1noy gain early advantages and excel on playmaking champions like Kalista, who he picked twice in the last 5 games and found great success. 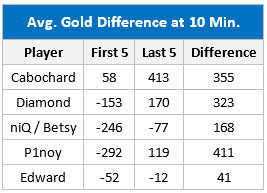 We have seen this success in the numbers as well, if we break down gold differential by role at 10 min P1noy saw the biggest change from the first 5 to the last 5, with a 400 avg. gold increase. Diamond also took a step back from farming a little bit. Overall, Gambit took a big step up with their early game and in particular P1noy came out of his shell a bit as a strong playmaker in the early game, and Gambit shifted their strategy with Diamond to help encourage that. This strong early game has given them a turn around in terms of winning potential as no longer would they get trounced mid game and end up with an unsurmountable disadvantage at 20 minutes. Now, Gambit has still a lot to work on, especially in their mid game, but has pulled a "reverse Fnatic" and is now ADCarried.